Hi-End Auto opened in the spring of 2005 and is dedicated in providing the ultimate automobile buying experience. 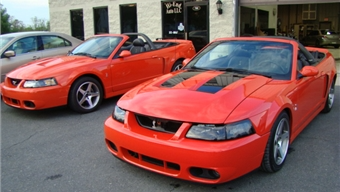 We specialize in late-model to older sports cars and more specifically 03-04 Ford Mustang Cobras. This is our hobby and we really enjoy meeting new sports car enthusiasts! Come in and look to see what we can offer you. Whether looking for a good looking sports car, need to get yours up to show quality, or need good financing on your new car we can make it happen. Hi-End Auto worked for years without the help of lenders. The financial crisis of 08 made the situation worse by lenders refusing to work with independent car dealers. We began farming out some of our business to a local Ford store as well as other franchise dealers. Finally we secured nationwide financing with major credit unions in 2014. We had great financing options even for the older Mustang Cobras at that time! Unfortunately this didn’t last long. 2018 brought many changes for us. Lenders started rejecting loans for the older cars. Parts are becoming difficult to source and preparing the Cobras for retail sale is becoming more difficult, costly and time consuming. These factors are causing us to reduce our inventory of the Terminators to a very low number compared to years past. We have placed over 1000 Terminators to very excited buyers and will be moving heavily to the 2011 5.0 Coyotes as they are easier to source and finance. We hope some of you will come to see us and this exciting new inventory! Whether looking for a good looking sports car, need to get yours up to show quality, or need good financing on your new car we can make it happen!